The following was written by Margery L. Stratton. Margery, grand daughter of Sir John Lumsden, was born and brought up in a small town in Pennsylvania in the United States, and spent a memorable year at Earlscliffe in 1935/6. This is her story. A memorable side trip while Dad was still there was to Wicklow to meet the family of friends of our family, The Robinsons, in Arklow. Little did I know that one day my widowed mother, Dorothy Lumsden would marry their cousin Guy Robinson whose father had lived in that house as a boy. It gave us a chance to see the countryside and I remember stopping at a private home for “tea” which was called to our attention by a sign by the road. There were many roadside homes in Ireland with a sign that said TEA – One shilling. Another evening a man from Howth named Paddy Connor who had a large dory which took people to Ireland’s Eye for outings, took the entire family with a large picnic basket for supper on that deserted island. The seabirds were plentiful and interesting to see. Summer’s end meant that Dad would be returning to the U. S. and I would be going to school. While Dad was there he bit down on something and his front tooth broke off. As a child a ‘pivot’ tooth that had been installed to replace a knocked-out front tooth playing hockey or rugby. He had been treated by the family dentist, Dr. Billy Stuart, and since Dr. Stuart was still in practice he replaced it again. At least twenty years had passed since the first situation. It caused a big laugh at the time. 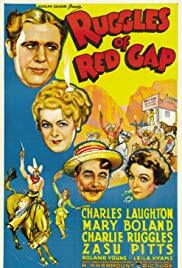 Ruggles of Red Gap, a 1935 comedy film with Charles Laughton. It was always a treat to attend the movies in Dublin and Granny loved to go into Dublin to see the latest “flick”(many of which I had seen as they were often a year old by the time they arrived in Ireland) If Granny asked me if I had seen a certain movie I would tell the truth but if she didn’t ask I didn’t offer to say I had already seen it at home. It was usually a night when Grandpa had a dinner engagement in Dublin and the two of us would have dinner at the Woman’s Exchange before the movie. Before or between the showings an organ would play old or new songs with the words on a screen and the audience would enjoy them. I learned many of the Irish songs that way. When I returned home Dad was so pleased that I had learned some of his favorites – like “Phil the Fluter’s Ball”!